4th lunar month of 1699: his father Iwai Hanshirô I dies. 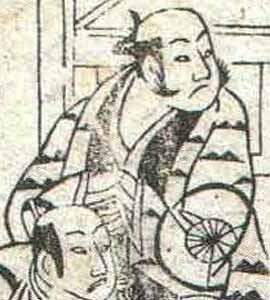 1710: his brother Iwai Hanshirô II dies. 11th lunar month of 1715: Iwai Takematsu takes the name of Iwai Hanshirô III in Ôsaka, becomes zamoto and produces the kaomise drama "Saiwai Mochimaru Chôja" for the nadai Ôsaka Tazaemon. The line-up is made up of the actors Miyazaki Denkichi, Nakamura Shingorô I, Ôtori Michiemon, Sanogawa Mangiku, Tomizawa Chiyonosuke, Sagawa Bunzô, Yamamoto Hikogorô, Yamamoto Sakuya I, Takashima Onoe, Ogino Samanojô II, Ôshima Kajûrô and Kamei Heizaemon. 11th lunar month of 1717: Hanshirô plays in Ôsaka at the Kado no Shibai the role of Torii Nagaonosuke in the kaomise drama "Benten Chôja Uga no Tama", which is produced by Ogino Kinnojô; he also performs a kitsune dance in this drama. 11th lunar month of 1724: Hanshirô plays in Kyôto in the kaomise drama "Yomeiri Miyako no Shimadai", which is produced by the zamoto Ogino Umenosuke for the nadai Ebisuya Kichirôbê. Fall 1725: Hanshirô plays the role of Hiranoya Tokubê in Chikamatsu Monzaemon's drama "Sonezaki Shinjû", which is produced by Ogino Umenosuke at Ebisuya Kichirôbê's theater; the role of Tokubê's lover Ohatsu is played by Sanogawa Mangiku. 11th lunar month of 1730: Hanshirô produces at the Naka no Shibai the kaomise drama "Meotogura Wagô no Nakatomi". His stage partners are Nakayama Shinkurô I, Anegawa Shinshirô I, Yamashita Kinsaku I, Kirinoya Gonjûrô I, Sakurayama Shirosaburô I, Sanogawa Hanazuma I, Arashi Sanjûrô II, Hanagiri Toyomatsu I and Izumikawa Sennosuke. 12th lunar month of 1731: Hanshirô produces at the Naka no Shibai the kaomise drama "Ôyamato Wagô no Tsuchi", which celebrates the arrival in the new line-up of Fujikawa Heikurô, Fujikawa Hanzaburô II and Arashi Sangorô I. 11th lunar month of 1732: Hanshirô produces at the Naka no Shibai the kaomise drama "Shikishima Wakô no Tsuzumi", which celebrates the arrival in the new line-up of Sawamura Chôjûrô I. 11th lunar month of 1733: Hanshirô produces at the Naka no Shibai the kaomise drama "Genji Rokujûjô", which celebrates the arrival in the new line-up of Sawamura Otoemon I. 11th lunar month of 1734: Hanshirô produces at the Naka no Shibai the kaomise drama "Honchô Bugaku no Hajimari". 11th lunar month of 1735: Hanshirô produces at the Naka no Shibai the kaomise drama "Toyo no Asahi Eitaigura", which celebrates the arrival in Ôsaka of the Edo actor Bandô Hikosaburô I and the shûmei of Arashi Kiyosaburô III. 11th lunar month of 1742: Hanshirô produces at the Kado no Shibai the kaomise drama "Sangoku Denrai no Ishi". His stage partners are Mimasu Daigorô I, Segawa Kikujirô I, Yamashita Kinsaku I, Mihogi Gizaemon I, Somenoi Hanshirô and Ichiyama Sukegorô I. 11th lunar month of 1743: Hanshirô plays at the Ônishi no Shibai the roles of Chûshichi and Imagawa Nakaaki in Namiki Sôsuke's kaomise drama "Futatsu Biki Nishiki no Manmaku", which is produced in Ôsaka by the zamoto Nakamura Jûzô I; his stage partners are Sawamura Sôjûrô I, Nakamura Tomijûrô I, Sanogawa Mangiku, Sakurayama Shirosaburô II, Nakamura Shingorô I and Arashi Shichigorô I. 11th lunar month of 1744: Hanshirô moves to the Naka no Shibai and plays the role of Hikoroku in the kaomise drama "Keisei Makura Gundan", which is produced by Anegawa Shinshirô I. 12th lunar month of 1745: the drama "Natsu Matsuri Naniwa Kagami" is performed for the first time in Ôsaka, simultaneously in the three major theaters of the city, which starts a competition for the best performance; Hanshirô plays the role of Issun Tokubê at the Kado no Shibai [casting]. Fall 1746: Hanshirô and Yamamoto Kyôshirô I go together to Edo. 11th lunar month of 1746: Hanshirô plays at the Ichimuraza the role of Itô Kurô Sukekiyo in the kaomise drama "Aioi Izu Nikki". 1st lunar month of 1747: Hanshirô's rank in the Edo hyôbanki, tachiyaku section, is jô-jô-(shiro)kichi (superior - superior - (white) excellent). He plays in the same theater the roles of Komurasaki Kamon and Yasaku in the new year drama "Tamakushige Yosooi Soga". 3rd lunar month of 1747: the play "Sugawara Denju Tenarai Kagami" is performed for the first time in Edo, at the Ichimuraza; Hanshirô plays the role of Kan Shôjô [casting]. 5th lunar month of 1747: Hanshirô plays in the same theater the role of Kan Shôjô in the drama "Onna Kan Shôjô Utsutsu no Narukami", whose plot and characters belong to the "Sugawara Denju Tenarai Kagami" world. 8th lunar month of 1747: Hanshirô plays in the same theater in the drama "Mangetsu Oguri Yakata". 11th lunar month of 1747: Hanshirô moves to the Moritaza and plays the role of Aoto Saemon in the kaomise drama "Aruji Môke Onna Hachinoki", which celebrated the shûmei of Sawamura Sôjûrô. 11th lunar month of 1748: Hanshirô plays at the Moritaza the role of Takatô Yoichi in the kaomise drama "Fuyu Botan Yoshino Dairi", which celebrates the shûmei of Azuma Tôzô II. 2nd lunar month of 1749: the play "Kanadehon Chûshingura" is staged for the first time in Edo, at the Moritaza; Hanshirô plays the roles of Teraoka Heiemon and Amakawaya Gihei. Fall 1749: Hanshirô goes back to Ôsaka. 11th lunar month of 1749: Hanshirô plays at the Ônishi no Shibai the roles of Eda Genzô and Azuma Hanshirô in Izumiya Shôzô's kaomise drama "Kotobuki Kogane no Kachi Ikusa", which is produced by Mimasu Daigorô I and celebrates the shûmei of Murayama Heijûrô IV. His others stage partners are Bandô Toyosaburô I, Arashi Sanjûrô II, Sanjô Namie I, Iwata Somematsu I and Nakamura Utaemon I. 1750: Hanshirô's uncontrolled passion for food leads him to obesity. 11th lunar month of 1752: the play "Ichi-no-Tani Futaba Gunki" is staged for the first time in Ôsaka, as a kaomise drama, at the Naka no Shibai; Hanshirô plays the roles of Midaroku and Taira no Tsunemori [casting]. 7th lunar month of 1754: Hanshirô appears on stage for the last time, in Ôsaka at the Kado no Shibai, playing 2 roles in the drama "Meigetsu Senri no Kane", which is produced by Mimasu Daigorô I. 1754 ~ 1759: Hanshirô goes to Edo and definitively settles there. He is too fat to perform anymore. His adopted daughter becomes the wife of the Edo star Ichikawa Danjûrô IV. Iwai Hanshirô III was an active zamoto of the first half of the eighteenth century, who spent most of his career in Ôsaka. As an actor, he was a tachiyaku and his forte were wagotoshi or jitsugotoshi roles.